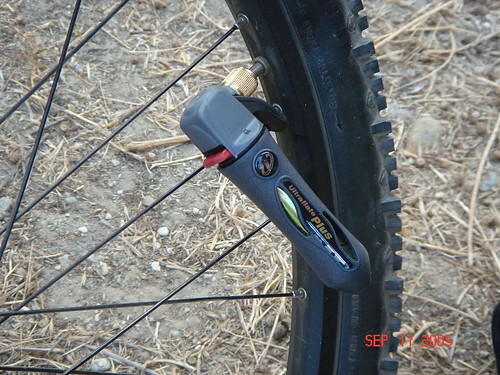 The roots of Genuine Innovations date back to 1986 when Tony Hollars approached bike shop owner, Jeff Bleecker with his idea for a unique controllable CO2 tire inflator for bicycles. Innovations in Cycling was born in 1989 when Jeff & Tony went into production with their first CO2 inflation device, the “GT Instaflate” which was sold to GT bicycles as an exclusively branded product for their new mountain bike line. In 1991 Jeff & Tony were approached by Reebok to develop a custom CO2 inflation device to be used with the popular Reebok “Pump” shoe line. By 1995 Innovations had produced over 1.8 million CO2 pumps for Reebok. We have since went on to develop the worlds leading line of CO2 powered tire inflation products for the cycling and motorsports industry sold under our Genuine Innovations brand. In addition to our standard retail products, we design custom engineered devices for industry using our patented and proprietary CO2 valve technology. Our experience ranges from designing advanced medical products for Fortune 500 companies to creating unique consumer products such as dust blowers and a CO2 powered air brush. Our engineers can review your needs and provide solutions featuring our exclusive CO2 delivery technology. As a product reviewer for Commute By Bike, I am providing my unbiased opinion of any products provided to us by any company. I do not posses any type of relationship with the product’s company or parent companies. I am not compensated in any way by companies that send in their goods to be reviewed. I am 5?7?, 174 lbs. I ride a Giant Warp DS 2 for trail riding and a Giant Cypress LE for my daily commute. I also own a 7 speed Gary Fisher Tarpon. I am mainly a XC rider that will occasionally have too much fun on my Warp. I am also a bike commuter traveling 10-20 miles each way. Fullerton Loop(Ca.) and the mean streets of Los Angeles County. Ultraflate Plus inflator comes with three 16g non threaded Genuine Innovations CO2 refill cartridges, Small Patch Kit, and two tire levers -â‚¬  plus a 3.5″ x 4.5″ zippered nylon bag to carry it all in. Ultraflate Plus is improved to accept ALL Innovations cartridges and Big Air! When we received the Deluxe Tire Repair & Inflation Wallet we really didn’t think much of it since it was so small and neatly organized in its own carrying case( wallet). The kit came with all you needed, 3 C02 cartridges, patch kit, inflator, and tire levers. In essence, all you needed to fix a flat came in this wallet that could be carried in the back of your pocket, hydration pack or seat bag. Even though we weren’t too impressed with the appearance of the Inflation Wallet Kit and its small CO2 cartridges, the little kit really got our attention. At first we thought that it would take at least 2 cartridges to properly fill up a 26×2.2 WTB Weirwolf tire to ride able air pressure. 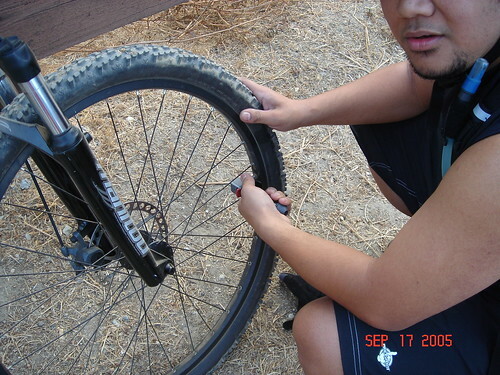 We deflated one wheel while we were on the trail because we weren’t lucky enough to get a flat during our ride. Then slipped in 1 CO2 cartridge ( remember that number). Mounted the Ultraflate onto the presta valve and squeezed the trigger. BAM! Within seconds the WTB Weirwolf tire was fully inflated! Moe and I cocked out heads back with a bit of amazement. Then we both looked at each other and started laughing because we were so blown away that it only took 1 and only 1 CO2 cartridge to inflate it to a ride able tire pressure. We still had about 6 more miles to go before we got back to the trail head. So an additional test was executed just by riding back to the car. When we got back to the car, the tire was still inflated. I got off the bike and stepped back and nodded with approval. Genuine Innovations has a great product here. The Deluxe Tire Repair & Inflation Wallet wasn’t much to look at, but under the pressure of a test, it exceeded our expectations. – Inflates fast, VERY fast! – None, this is an excellent product. Reasonably priced. Ignore the fat guy in the picture, but this is an action shot of the Ultraflate! Genuine Innovations makes an excellent product. We were really impressed with the performance and ease of use the Deluxe Tire Repair & Inflation Wallet provided. We highly recommend the kit to everyone. You can find more information about the products offered by Genuine Innovations by visiting their SITE.